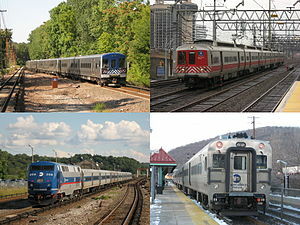 The Metro-North Commuter Railroad, or Metro-North, is a suburban commuter rail service in New York. It is run by the Metropolitan Transportation Authority (MTA). It is the second largest commuter railroad in the United States. Metro–North goes from New York City to the New York Hudson Valley. It also has stops in Connecticut. Riding Metro-North in New York City costs less than riding it outside the city. There are 122 stations. There are five Metro-North Railroad lines. It has over 775 miles (1,247 km) of track. The lines are more than 385 miles (620 km) long. ↑ "The MTA Network". Metropolitan Transportation Authority. Retrieved 6 February 2015. ↑ 2.0 2.1 "Comprehensive Annual Financial Report for the Years Ended December 31, 2012 and 2011" (pdf). Metropolitan Transportation Authority (New York). June 21, 2013. p. 147. Retrieved 2014-08-29. ↑ "MTA Metro-North Railroad". Metropolitan Transportation Authority (New York). Retrieved 2014-08-29. This page was last changed on 6 January 2019, at 17:40.